For some reason, in AP English senior year, we had to memorize Hamlet’s soliloquy. I’m not opposed to memorizing things, but I’m really not sure what the point of us doing it was. There were something like nine of us in the class, and one by one, we had to stand in the front of the room, racing through words like bodkin, contumely and fardels while Dr. Scott looked on, making notes in her worn copy of Shakespeare’s collected works. What is a bare bodkin, anyway? I still remember the first third of Hamlet’s existential diatribe, and as you may expect, anytime I’m prepping some meats for the grill with a dry rub, without fail, the words, “ay, there’s the rub,” leap from my mouth almost reflexively. It’s not my fault. It’s Dr. Scott’s. I laugh knowing that one day, my future children will glance at me sideways just as I always do when my father mumbles on about lightning striking, thunder crashing and ultimately “splitting bananas half in two” every time he’s unpeeling the fruit for breakfast. While this recipe is lacking in glamour and more than one photo, it’s important to share. 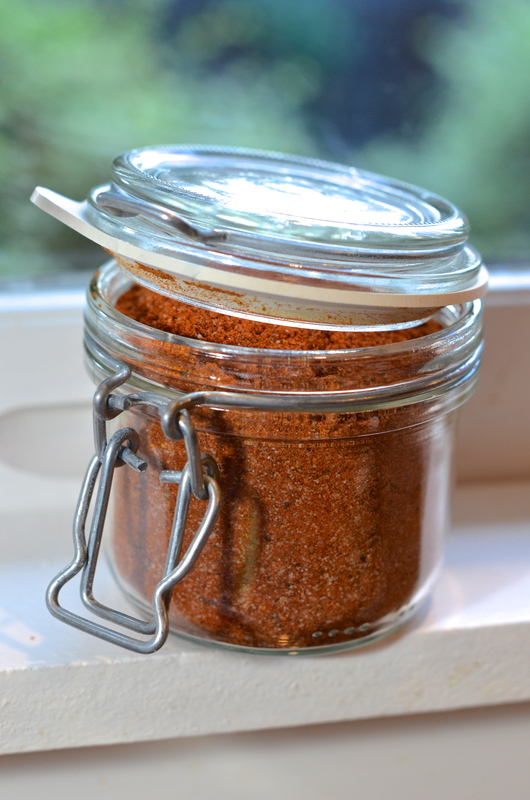 We use this dry rub for beer can chicken, for pork tenderloins, ribs and really for anything else that we think deserves a bit of flavor before it succumbs to the heap of smoldering coals outside. There are a lot of good football games tomorrow night and I figured some of you may be firing up the grill. If so, you’re going to need this. Place all your ingredients in an air-tight container and shake to mix. Keep on hand in the pantry until you need it. When you’re ready to use it, rub it all over your meat before you throw it on the grill. That last sentence may have made this post NSFW.